There has been a lot of discussion lately across many sites regarding Socket 1156 burning up and charring to the socket and pin area. 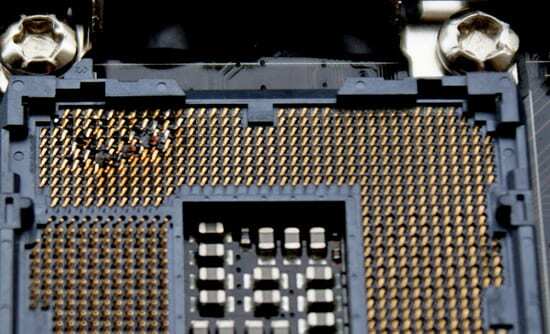 The rare problems we have seen are on the Foxconn made socket and tend to only occur when using extreme voltages, clock speeds, and extreme cooling. Recently there has been one publicly posted occurrence of the Lotes socket showing the same failure, under the same extreme circumstances. While this is an obvious issue for extreme benchers, a valid question was raised regarding moderate overclocks on air or water, and whether this problem could happen to them. There are a couple potential causes of this issue. One theory is that a lack of contact between the pins and pad leads to socket burning. In the 1156 socket, when using extreme voltages the pins tend to get hot and cause them to burn up, this does not happen in S1366 since there are more pins available to carry the amperage needed to sustain extreme overclocks. A notable and respected extreme overclocker, has theorized that it may not even be at the pin level but a deeper issue in the socket itself. It is suspected to be a feedback-type issue when surpassing a certain power threshold. Again, these are web-provided theories and opinions, and not facts. Using the omnipotent Google, I could find no occurrence of this issue occurring at stock settings or while running moderate overclocks. But the concern with this is not in the short term, but over the long term. What voltages will this begin at? How long at a particular voltage will take to show signs of this issue, if any? Will it happen at stock voltages? All these are questions that cannot be answered now, unfortunately. Right now the general consensus in the overclocking community is that it’s a non-issue for non-extreme overclocks. If it is still a concern to you (which at this point it shouldn’t be), one can purchase a motherboard with a Lotes socket as the frequency of the problem, at least at the time of publication, was significantly less (once as far as I can tell). 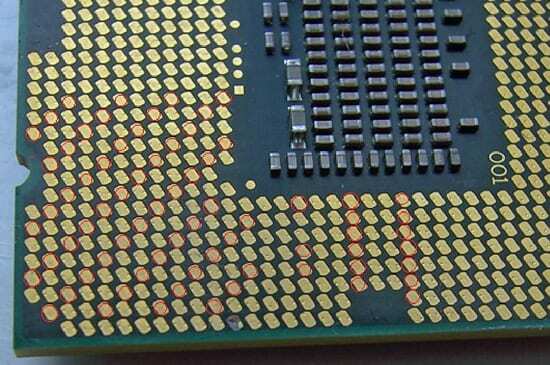 It has also been rumored that Intel may be revising the socket. This has yet to be confirmed by Intel at this time and is only a rumor. If you would like to circumvent this seemingly rare issue altogether, you can go with the proven Socket 1366 at this time. Remember, there have only been a few documented problems with this and so far only at extreme voltages and clock speeds. Part two, and likely the final installation of this article will be published once some concrete evidence has been provided about the viability of the socket not breaking down over time for normal overclocking, or any major changes in the socket to prevent this issue from occurring even in extreme circumstances. If you have further information or would simply like to discuss this issue, please click on the discussion link thread. Editor’s Note: Thanks to Anandtech for allowing us to use their photos. For more information and photos check out Anandtech: P55 Extreme Overclockers: Check your sockets!